Maybe Janet Yellen should run for president? She might get a bunch of votes from Wall Street traders. The Nasdaq hit a new all-time high on Thursday. And the Dow and S&P 500 both moved into positive territory for the month, an impressive feat given that September is historically the worst month of the year for stocks. Stocks popped Wednesday afternoon after the Fed held rates steady. Fed chair Yellen, speaking at a press conference, seemed to suggest that a rate hike could be in the cards at the Fed's December meeting. But further hikes in 2017 and 2018 may be gradual. That is just what the market wanted to hear. Forget about the contentious presidential election, worries about Europe and China and more terrorism fears. Investors are still obsessed with how fast Yellen will raise rates -- and what other central banks around the world do too. To that end, the Bank of Japan pleased investors around the globe Wednesday by pledging to keep long-term rates near zero for the foreseeable future. So can stocks keep rallying? Investors are clearly in a more cheery mood now than they were earlier this month. CNNMoney's Fear & Greed Index, which tracks seven measures of market sentiment, is back in Greed territory. It was showing signs of Fear only a week ago. I spoke with several investment strategists Thursday to get their thoughts on the Fed and the markets. I tweeted out some of their comments. (I call these rapid fire exchanges tweeterviews.) Here are some of the highlights. Kate Warne, investment strategist for Edward Jones, thinks that Yellen said everything right. One might say she was more of a maestro than former Fed chair Alan Greenspan ever was. Talking to Kate Warne, strategist at Edward Jones, now about stocks. She thinks investors happy that Fed's pace of rate hikes may be slower. Warne said that every comment from Yellen sounded like Fed is happy with economy but still chose to not raise rates. Investors like that. 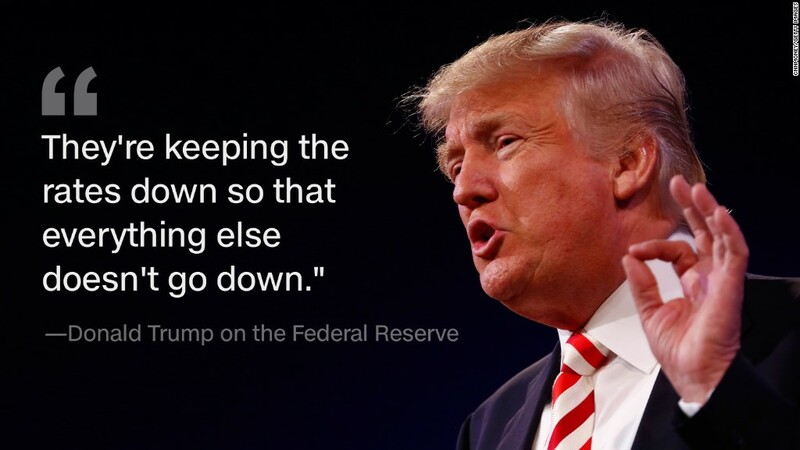 Shannon Saccocia, head of asset allocation and portfolio strategy for Boston Private Wealth, added that investors need not fear that claims from Donald Trump about the Fed not being politically independent will influence its policy decisions. She thinks there is zero chance the Fed will raise rates at its next meeting in November. Talking to Shannon Saccocia of Boston Private Wealth about Fed. She thinks market is happy that rate hike appears to be pushed to December. Boston Private Wealth's Saccocia said some think Fed could/should show independence by hiking just before election. But doubts that it will. But not everyone is happy with Yellen's performance. David Lafferty, chief market strategist at Natixis Global Asset Management, worries that Yellen and other Fed members are spending too much time focused on the global financial markets and not the U.S. economy. Lafferty says Yellen has done good job of telegraphing Fed moves. But concern is that "absurdly" lower for longer may become self-defeating. Lafferty says Fed has to go back to dual mandate. Inflation + jobs. Fed is "weak" to be focusing so much on global economy & stock market. And Brian Nick, chief market strategist at TIAA Global Asset Management, is concerned that the Fed may be sending mixed messages. Fed members may need to follow the advice that Aaron Burr gives Alexander Hamilton in the Tony/Grammy/Pulitzer award-winning musical. "Talk less. Smile more." Nick speaks from experience. He was a former market analyst at the New York Fed. ... Brian Nick worries Fed is now so transparent that it does box them in. But still data dependent. So incomplete grade on communication. Saccocia agrees that the Fed may have created a problem for itself by talking too much. Has Fed lost credibility? Boston Private Wealth's Saccocia doesn't think so. But said Fed partly responsible for market moves/expectations. At the end of the day, Warne said that either a President Trump or President Clinton would probably just leave the Fed alone. There have been numerous times in the past few decades where the Commander-in-Chief and Rate Setter-in-Chief worked well together despite being from different political parties. There's no reason for that to change. Warne thinks that Yellen's latest comments remove any fear that the Fed is going to drastically raise rates. If anything, the Fed could finally wind up getting the help it needs from the White House. Both Clinton and Trump have talked more about trying to boost the economy through increased government spending and some tax reform. Bottom line about election from Warne. Both Trump & Clinton talk about more government spending. Will it work? Who knows? But market likes. So for now, the market seems to be viewing Trump and Clinton stimulus talk as good news when combined with the Fed's pledge to not raise rates too quickly. Or to quote the late Robin Williams in "Mrs. Doubtfire" -- help is on the way!